For the people of the fictional Earth, there was no time left in Nevil Shute’s classic novel and Stanley Kramer’s epic film. And there may not be any time left for the people of the actual Earth if authoritative warnings about the dire effects of the Daiichi nuclear plant disaster in Fukushima, Japan turn out to be correct. 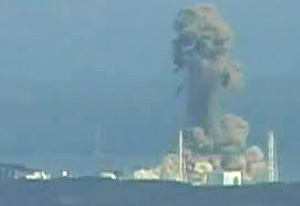 Explosion from Fukushima Daiichi nuclear plant. Naoto Kan was the Prime Minister of Japan at the time of the now confirmed partial meltdowns of three nuclear reactors following the March 11, 2011 Tohoku earthquake and tsunami. Kan assured the press that the evacuation order for a 20-mile radius around the stricken plant would be sufficient. 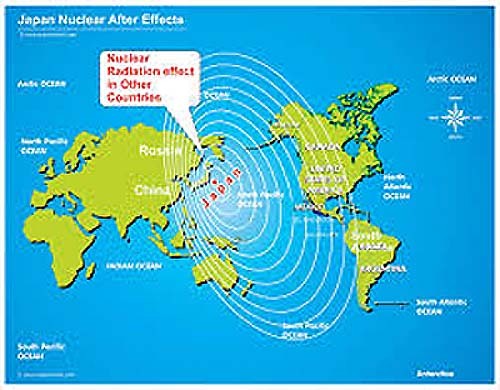 However, Kan’s statement was based on assurances and reassurances from Japan’s Nuclear Safety Commission that the evacuation zone was sufficient. It turned out that the commission was packed with shills for the nuclear plant operator, the politically-powerful Tokyo Electric Power Company (TEPCO). In addition, the powerful General Electric, the manufacturer of the nuclear reactors, mobilized its army of lobbyists and public relations flacks to pepper the broadcast and web media with propaganda and “sock puppet” comments on blogs posted by paid trolls criticizing any suggestions that Fukushima represented a major disaster. Kan, a member of the opposition Democratic Party of Japan, is now opposed to nuclear power generation. Kan’s words are powerful. “The most severe accident in the history of mankind” are words not to be taken lightly. The current Liberal Democratic Party Prime Minister, the far right-wing Shinzō Abe, favors restarting Japan’s 54 working nuclear reactors, shut down in the wake of Fukushima. Abe is supported by multinational companies, including TEPCO and GE, that put profits ahead of people. Like Kan, Koizumi made a 180 degree turn in announcing his opposition to nuclear power plants. It is obvious that these two former Japanese Prime Ministers of opposing political parties know something that has been slow to be conveyed to the general public. The world is in trouble as a result of the Fukushima melt downs. And it isn’t a question of there still being time left but how much time is left. The debate over the Affordable Care Act in the United States may soon shift from whether one wants to participate or not to one of triaging medical care for those with short-term effects of terminal cancer from the effects of Fukushima radiation to those with medium- and long-term effects. If the worst-case scenarios play out, there will also be a debate over whether government or private health care plans will cover euthanasia for those who will die a painful death from the effects of airborne and seaborne radiation from Fukushima. Although Prime Minister Kan doesn’t believe that the most critically-effected reactors at Fukushima have melted through the bottom containment vessel, other nuclear power specialists are not so sanguine. Dean Wilkie is a nuclear plant engineer at the Department of Energy’s Idago National Laboratory. In an interview with WERU-FM in Bangor, Maine on August 7, Wilkie said he believes some of the Fukushima reactors melted completely through the base of the reactor building and that highly radioactive water is saturating the ground soil. Canadian nuclear expert Gordon Edwards concurs. In an August 12 interview, Edwards stated that Units 1, 2, and 3 at Fukushima have either melted through the reactors’ buildings into the ground or are in the process of doing so. This scenario sets up the “China Syndrome” popularized by another motion picture with the same name. The syndrome is that if cold water is not constantly pumped onto the molten cores, they will descend into the earth’s crust, creating a molten radioactive mass that will melt right down to our planet’s core and, eventually emerge on the other side of the Earth. In the “China Syndrome,” a melted down core in the United States was to have melted through to China. But TEPCO is covertly pumping seawater from the Pacific Ocean to cool down the molten reactors. This highly-radioactive seawater is seeping back into the ocean. The nuclear energy industry, led by Exelon, General Electric, Duke Energy, and Westinghouse, are investing hundreds of millions of dollars to place bogus news stories in the media and attack nuclear industry critics by playing down the adverse effects of the Fukushima disaster on the world’s population of humans and other living creatures. Those who warn of the dangerous after-effects of Fukushima are being referred to as doomsayers and kooks by the Brooks Brothers suit-clad PR flacks of Washington’s K Street and New York’s Madison Avenue. The fact that President Barack Obama, who has received tons of campaign cash from Exelon, would not stand by his own NRC chairman, provides full evidence of the power of the nuke industry in framing the debate and defeating its opponents. But the face savers for the nuclear industry cannot explain the complete reversals of two Japanese Prime Ministers from opposing political parties on nuclear power and Kan’s apocalyptic statement that Fukushima is the worst accident in the history of mankind. And the nuclear energy apologists and paid shills cannot convince people to avoid Pacific Ocean seafood, including blue fin tuna caught off the U.S. west coast and seaweed, which are now registering high and unsafe levels of radiation. The nuclear industry lackeys are even pushing the inane meme that one receives more radiation from eating a banana than from eating Pacific seafood. Covertly grab all the elected lackies, bought and paid for by this industry, force them onto an island in the Pacific, and make their only source of food the natural habitat. I am glad someone finally mentioned “On the Beach”. I’ve been thinking about it ever since Fukushima. It is all too clear that that the safeguards surrounding nuclear power generation are, when seriously tested, woefully inadequate and that transparency – and thus accountability – concerning nuclear accidents is also seriously impaired when confronted with the corrupting influences of a powerful nuclear power/weapons lobby and a corrupt government wedded to secrecy and all too eager to cover up its incompetence. Nuclear power is far too dangerous a proposition in the long term because accidents are inevitably going to happen and when they do, however rare that may be, the long term effects on the ecosystem are wide ranging, severe and, because of their unpredictable nature, virtually unquantifiable thus making them easy to dismiss or ignore. We must move away from this technology as soon as possible and learn to rely on technologies that are less dangerous.